Hear it from the champs! Interview after the race available above. 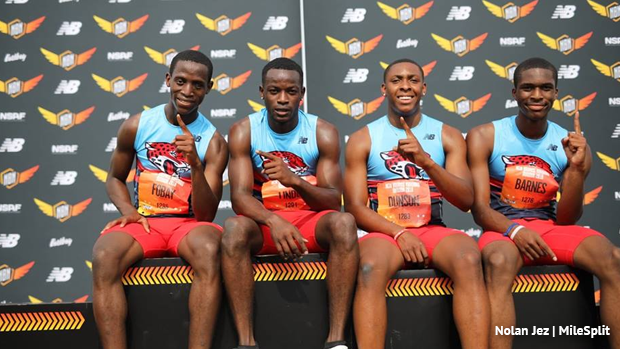 East Orange Campus certainly went after it to win the boys shuttle hurdle relay on Saturday at New Balance Nationals Outdoor in Greensboro, North Carolina. The East Orange squad a blazing 56.86 to best second place by almost a full second! A gap of .92 was set between their gold medal run and Virginia's Western Branch's time of 57.78 for second. This is their second straight outdoor national championship in the event and their fourth straight year in the top three. East Orange's championship run this season was made up of Akeem Lindo as lead off, to Al-Tariq Dunson, Ibrahim Fobay, and then Malcome Barnes as the anchor. They finished .32 off the meet record and state record of 56.54 set by Union Catholic in 2013. New Jersey also saw Rahway in fourth running 58.91 and Holmdel in sixth 1:00.11 as All-Americans, then Central Regional eighth 1:00.72 and Kearny ninth 1:00.98.